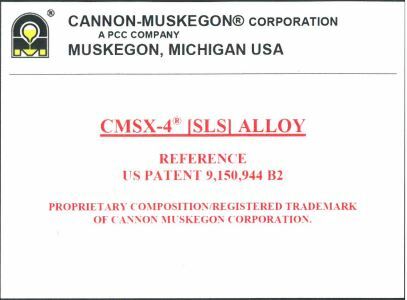 Cannon Muskegon commenced cast superalloy modification work in the late 1970’s with CM 247 LC® alloy (also known as Rene’ 108), a DS derivative of MAR M 247 alloy. Because of the excellent castability (freedom from DS grain boundary cracking and equiaxe hot cracking), strength and ductility – including fatigue properties, CM 247 LC® is used since 1984, for flight and industrial engine blades and vane segments (DS & equiaxed), integral axial turbine wheels and nozzles and high performance turbocharger wheels (Formula 1 racing) by at least 14 OEMS worldwide. CM 939 Weldable® – Structurally Weld Repairable IGT Vane and Flight Engine Integral Nozzle and High Temperature Structural Part Alloy (10 Years Engine Operating Experience). Lower Re content, cost & density compared to current 3rd generation SX alloys. SX casting yield, casting quality and turbine engine airfoil component performance results – including component lifing/durability, for these CM manufactured proprietary alloys, is acknowledged by the gas turbine industry as world-class.